Today, both Sara Kuhn (right) and Heather Rogers, UND Chester Fritz Library’s newest research librarians, are happy and proud of what they do. To get to UND, they traversed their own winding routes and, nonetheless, share some similarities. Photo by Dima Williams/UND Today. An inquiry about Grand Forks’ mosquito control is not a common question for a librarian. Yet, Sara Kuhn took it seriously – just like any other. 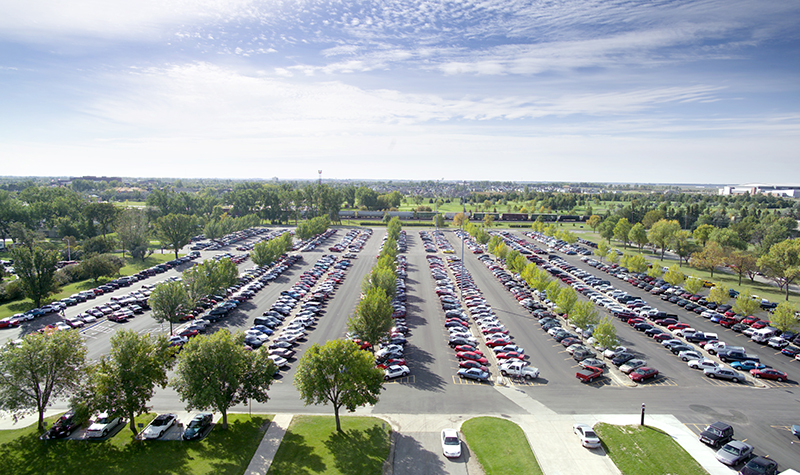 In the process of seeking an answer whether the City and the University of North Dakota coordinate their spraying schedules, she learned something new for her, too. Although it may be an odd – and admittedly rare – query, it captures what research librarianship is about. It offers a chance to perpetually learn. But more importantly, it presents an opportunity to etch a positive mark on students, faculty and their work. It is the latter that motivates Kuhn, who arrived at UND a year ago, and her colleague Heather Rogers, who stepped in as an education & human development librarian this semester. “I get a lot of professional satisfaction out of really helping students at different stages of their academic careers,” said Rogers. Today, both Kuhn and Rogers appear happy and proud of what they do. But to get here, they traversed their own winding routes and, nonetheless, share some similarities. 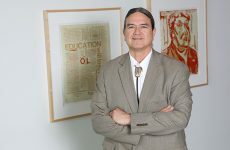 Both ventured into disparate professions and to foreign lands before settling at UND. Born in Grand Forks to UND alumni, Kuhn grew up in Fargo before enrolling at the University of Utah in Salt Lake City, where she majored in modern dance. Rogers also left home for college. A native of Long Island, New York, she obtained a bachelor’s in Japanese and political science at the American University in Washington, D.C.
With diplomas in hand, Kuhn and Rogers were on the move once again. Kuhn jaunted to San Diego, where she performed. Later, she returned to the city of her alma mater to become a flight attendant. “I had realized early on that modern dance didn’t pay all the bills,” she said. She still performed but for her own pleasure. Tending to airplane passengers soon proved devoid of intellectual rigor, however. So, Kuhn volunteered in a public library and began to climb the hierarchy, ascending from book shelver to assistant librarian. Her drive to become a “real, full-fledged” librarian pushed her to the University of British Columbia in Vancouver, where she got her master’s degree in library and information studies. “After working at public libraries for 10 years, I wanted a new challenge, I wanted to go into academic libraries,” Kuhn said. She traveled to Malaysia to work at the Monash University, an Australian institution with an offshoot in in the Southeast Asian nation. There Kuhn met her husband. Seeking a place to commence their family life, they opted for North Dakota, where Kuhn’s parents still live. After AU, Rogers relocated thousands of miles away. She spent several years in Japan, where she taught English. She also farmed and, like Kuhn, volunteered in a library, a gig she relished more than her paid position. 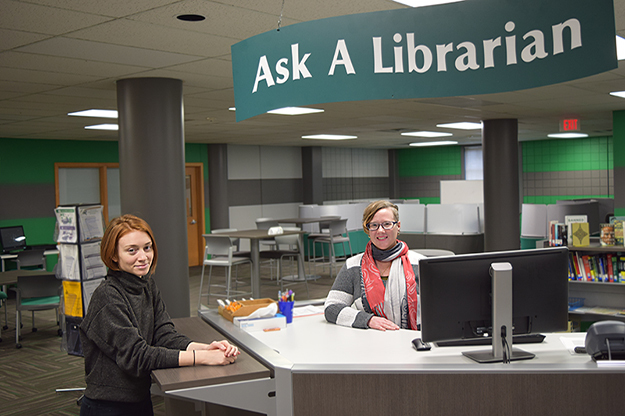 “That is when I discovered I wanted to pursue librarianship because it combines a lot of my interests like research and helping students,” Rogers said. She journeyed back to the Western Hemisphere to obtain a master’s degree in information studies at McGill University in Montreal. Upon graduation, she arrived at UND late this summer. For Kuhn, it was her childhood impressions of libraries, growing up in Grand Forks and Fargo, that prompted her to go into the profession when she searched for a new career. Photo by Dima Williams/UND Today. Even though life nudged Kuhn and Rogers toward different pursuits, librarianship emerged to the fore of their lives. Their vocation seems to have been there all along – they just needed to realize it. For Kuhn, it was her early impressions of libraries that prompted her to go into the profession when she searched for a new career. “It felt like a very safe, creative, intellectually inspiring place to be, to be surrounded by books and those lovely helpful librarians,” she said of her memories. Rogers shared a similar tale about her high-school resource center, where she befriended an amiable librarian, who guided her through pivotal choices long after she had left town. “It was actually that high-school librarian who encouraged me to pursue librarianship when I reached out to her when I was teaching in Japan,” Rogers said. While the libraries of Kuhn and Rogers’ recollections may have bulged with formidable tomes, their modern-day academic counterparts like the Chester Fritz Library are much more than repositories for literature. They are hubs for flexible, tech-enhanced studying that requires librarians to be learners and teachers at the same time. Kuhn and Rogers have mastered that dichotomy, and play a pivotal role in support of UND research and the institution’s aim to attain Carnegie R-1 classification in the future. “Books are there and I still help students find the books that they need, but it is just a small part of everything that we do,” said Kuhn. Their job entails a grasp of expansive databases and complex software as well as an aptitude to instruct students and faculty how to access and utilize them. 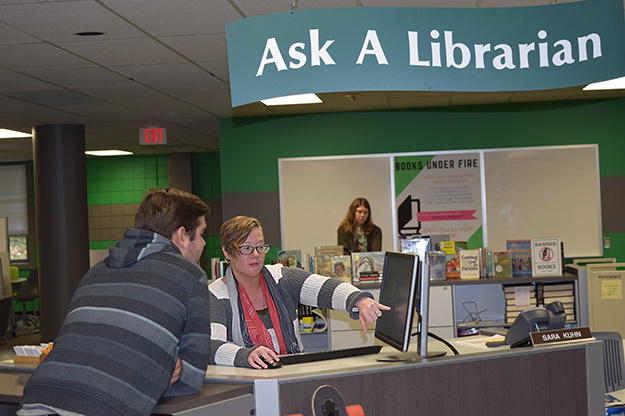 Often, it is librarians’ duty to ensure the spread of the academic possibilities at the Chester Fritz Library. So, they network extensively. “Every day you are always meeting someone new, you are always reaching out and through one contact, you are meeting other people in different departments,” said Rogers. Kuhn and Rogers frequently give presentations on library resources in various courses. Sometimes, they drop by at student events. Together with their colleagues, they lead sessions in library instruction, academic integrity and information literacy in introductory English classes. All this happens when they are not immersed in students’ research questions or peculiar inquiries like the one about mosquito spraying.